Your Connection to Nature, through Art, Science and Community . 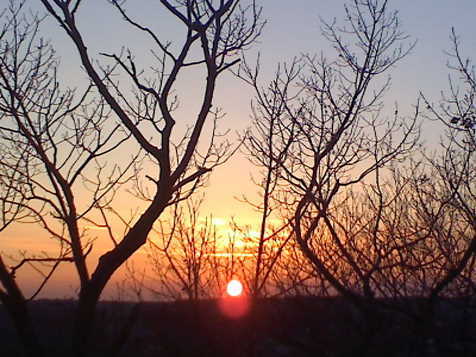 . .
Turkey Hill Park offers expansive views, great vantage points for sunsets. A reflective moment, on all that has transpired in 2010. Peace to all, in Arlington, our country, and to all on our fragile and wondrous planet. Here’s to the adventure and beauty of living! Enjoy these outdoor scenes, then get outside and experience Nature firsthand! Contributions or Comments welcome. Turkey Hill Park is a lesser-known Arlington Park (map here). It’s a quiet peaceful place, suddenly a bit more popular maybe due to having “Off Leash Hours” from 6AM to 9AM everyday. Welcome canines and their people! 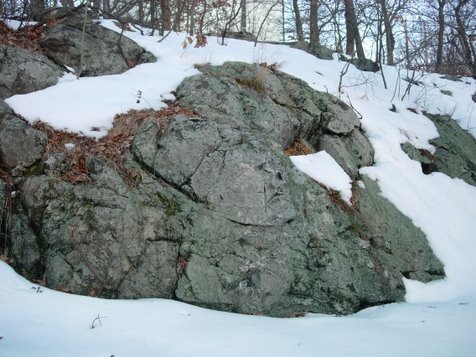 Snow highlighted the rock ledges on this New Years Eve Day! 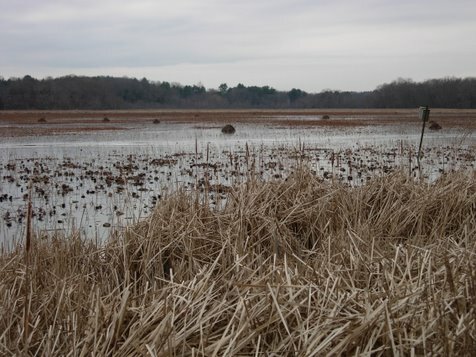 The Great Meadows National Wildlife Refuge in Concord MA is just a short distance from Arlington, by car or bike (map here). Great online resources at the US Fish and Wildlife Service site. Lots of muskrat activity is evident from a dike that goes out into the wetland. Great network of trails, parking, bathroom facilities. Worth the trip – plan a visit soon! 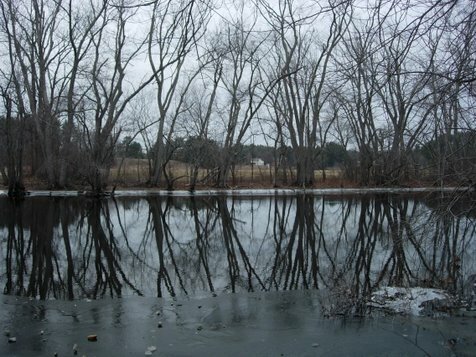 The Concord River runs along the northern edge of the Great Meadows National Wildlife Refuge in Concord MA . On this cold December day, beautiful ice patterns formed along the edges, leaving the center slowly moving. The graceful structures of trees along the riverbank was poetically reflected. 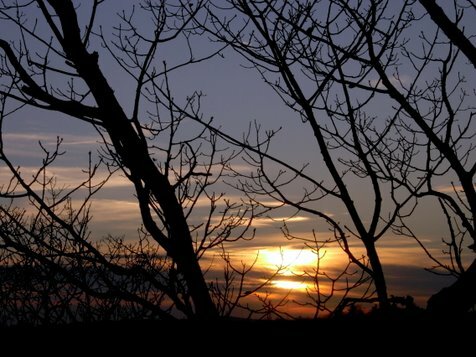 For a wonderful website about the Great Meadows NWR see: Sense of Place Concord by Cherrie Corey. Guided hike schedule too! 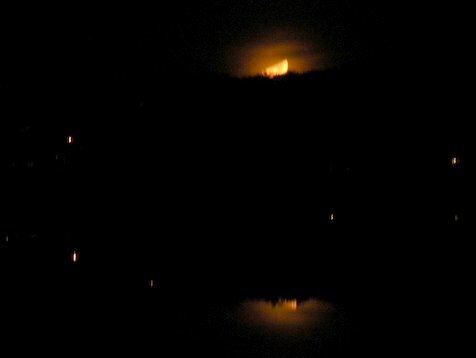 After seeing the spectacular moon set on November 13, I’d hoped to get a photo of the full moon setting over Spy Pond. Crystal clear skies at midnight, but a thick cloud layer hid the setting moon at 6:20 AM. Spy Pond was dimly lit by the first scattered rays of light, and very quiet, even the birds still at this early Sunday hour. 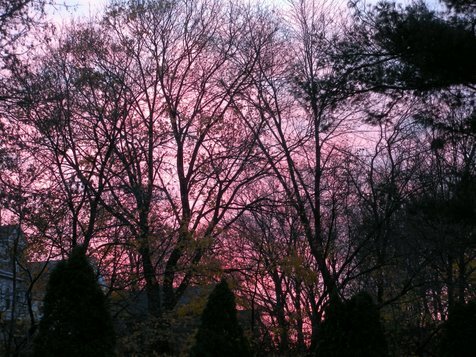 Turning around, the rising sun was pink through the clouds and trees along the Minuteman Bikeway. Most trees along Spy Pond and the bikeway have now lost all their leaves, showing numerous squirrels nests in the upper branches. 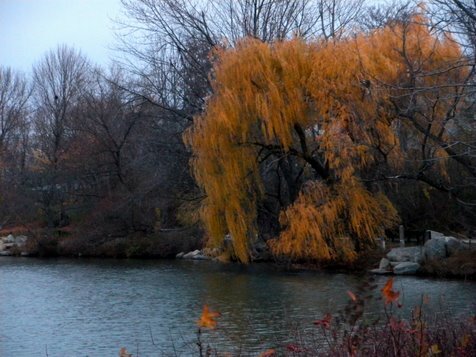 The willow near the waters edge though still hangs on with a vibrant splash of color. Willows are also among the first trees to show a shimmer of green in early Spring. Saturday November 13 2010 was an unusually warm and pleasant day in Arlington. 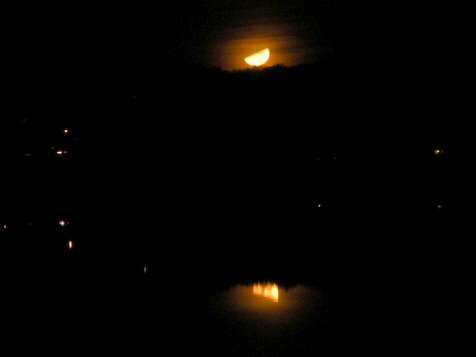 The moon set at 11:20 PM over Spy Pond that night was truly spectacular. Click through the three photos in sequence here to follow the moon’s graceful descent to the horizon. In it’s “First Quarter” phase, the moon appears as a half-lit disc. First Quarter means the moon is 1/4 of the way through it’s monthly cycle. The moon “waxes” towards a Full Moon on November 21st. 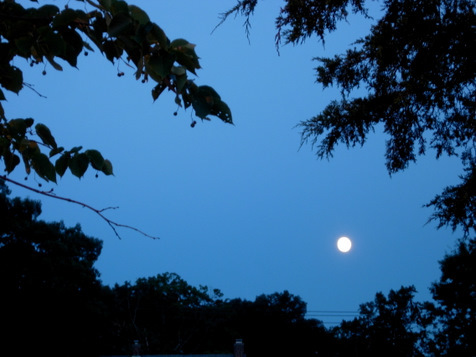 The November Full Moon will set about 6:30 AM. 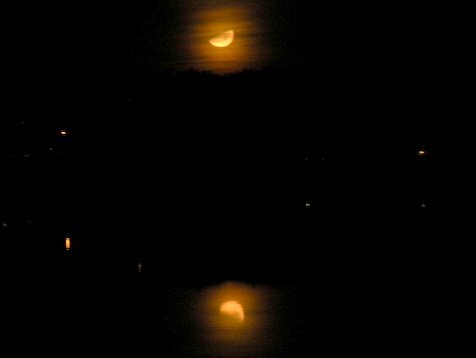 At this time of year, and viewed from the edge of Spy Pond at Linwood Circle, the moon sets across the pond and behind the ridge that runs along Pleasant Street between Brunswick Road and Kensington Park. 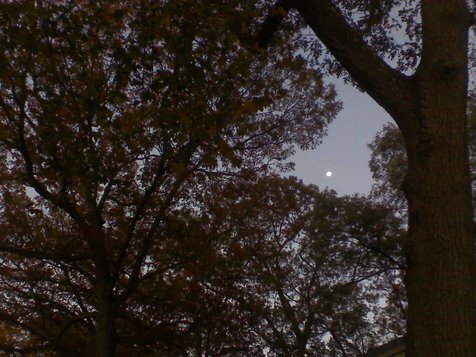 Where does the moon set near your house at this time of year? When the moon is in it’s “First Quarter” phase, it rises near noon and sets near midnight. When the moon is “Full”, moon rise is near sunset and moon set is near dawn. Enjoy these outdoor scenes from nearby Arlington, then get outside yourself and experience Nature firsthand! Contributions to this photo series welcome (email us). The November Full Moon is known as the Beaver Moon or sometimes the Frosty Moon. The night these photos were taken temperatures were in the mid 40s, but often in November it can be even cooler. Even though I’ve lived in Arlington for over 8 years, I didn’t know that great moon sets were visible from Spy Pond until I noticed by chance, while riding on the bike path. Of course, the position will change with the seasons. November seems to be a great month for it. 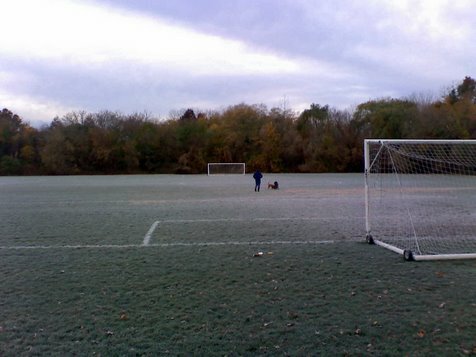 Thorndike Field was shimmering with a white frost this morning. While temperatures may have dipped below freezing on some nights already this year, frost formation requires specific circumstances: the dew point temperature must be lower than freezing with winds calm. Citrus growers in Florida and California sometimes install large fans to prevent frost. 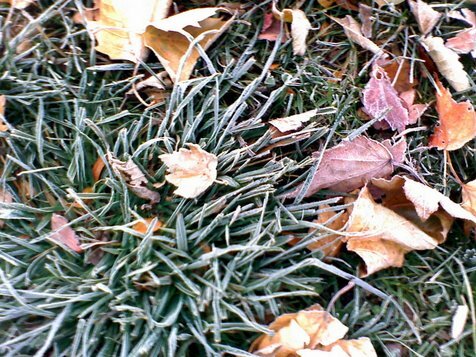 Frost can make beautiful patterns on grass and Fall leaves. When the air is heavy with water vapor and conditions are right, spectacularly large crystals can form, as photographed in December 2008 for the Arlington Natural Connections Blog. The Unitarian Universalist sugar maple at Arlington Center now with most leaves gone, shows its impressively strong and elegant branch structure. We’ve had wide temperature swings this past week, some days feeling like summer, some nights dipping near freezing. This photo was taken on October 27, in early morning fog, a common occurrence lately. 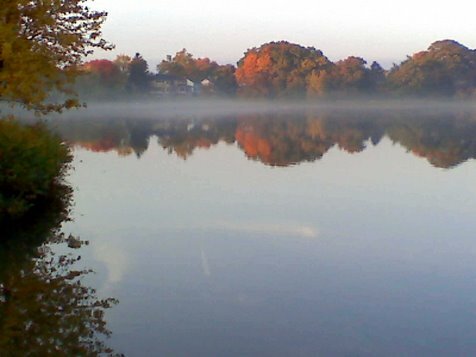 Of the 7 bodies of water in Arlington, Spy Pond may be the best known. Located near Arlington Center, and visible from the Minuteman Bikeway, Spy Pond views vary widely from day to day and from season to season. On this morning, an atmospheric low-lying fog layer made for a picturesque scene. With little wind, the water surface was glassy, reflecting the colorful fall trees and clouds overhead. A waning morning moon, heading down for a later morning moonset is visible between these oak trees on Old Colony Road, about 7AM. Next full moon: November 21. These trees will be showing bare branches then. 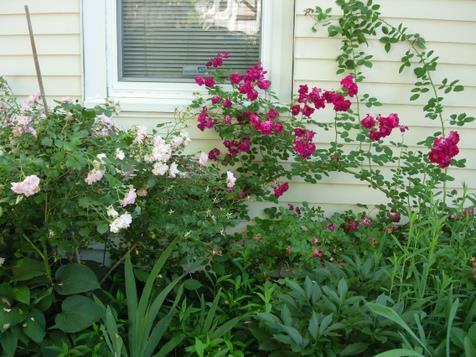 It seems roses have been beautiful since early spring and all throughout the summer. Many varieties put out a “last bloom” in Fall, like these along Magazine street, one of the more attractive boulevards leading to Central Square. 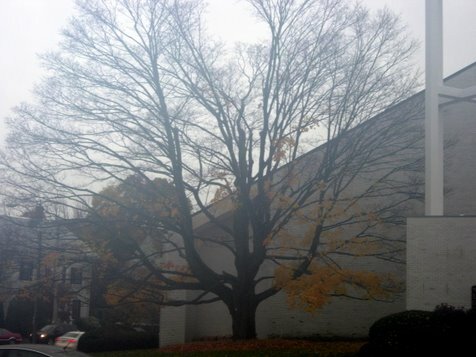 The sugar maple in front of the Unitarian Universalist Church at Arlington Center has now lost many leaves from the upper branches, and has only a few green leaves left. How soon before all the leaves are gone? As part of Winchester’s Environmental Fair, wetlands scientist Nancy Lin, led a nature walk along the Aberjona river, just on the other side of the train platform from the town common. While the river did look pretty, many invasive species were in evidence, including bittersweet – one of the worst. 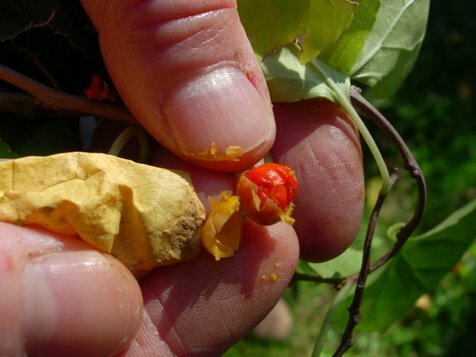 The bright yellow berries will soon shed their outer skins to reveal a bright red. The vines are deadly to trees and other plants – please help eradicate this bad actor! Enjoy these outdoor scenes from nearby Arlington, then get outside yourself and experience Nature firsthand! Contributions to this photo series welcome (email us).. 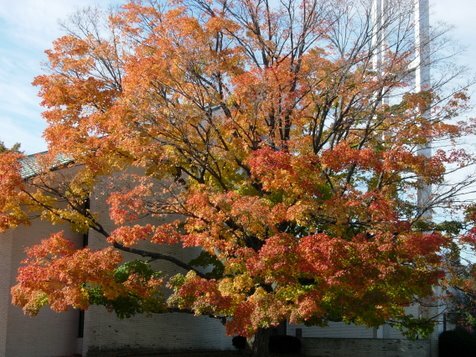 This sugar maple in front of the Unitarian Universalist Church at Arlington Center is a prominent gauge of the progress of seasonal change. Daily change is especially evident in Fall and Spring. 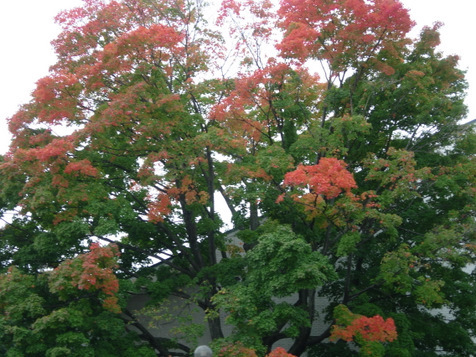 This photo was taken the day after Town Day, and shows red colors just beginning at the periphery of this tree’s wonderful canopy. 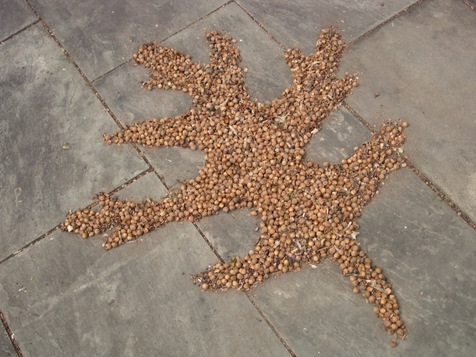 Acorns covered the patios and sidewalks of Arlington. They were numerous, at time hazardous to walking or biking. This acorn art is modeled, appropriately, after an actual oak leaf. Fall 2010 arrived in Arlington at 11:09 PM on September 23. 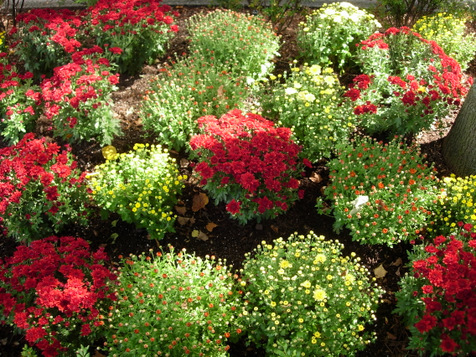 This collection of mums was already in place, just in case anyone was in doubt of the change of seasons. The National Chrysanthemum Society tells us that petals on chrysanthemums are actually florets. The chrysanthemum flower has two types of florets – ray florets that would be called petals on a daisy, and disc florets that are the center florets in a daisy type of bloom. Take a closer look, next time you see them. 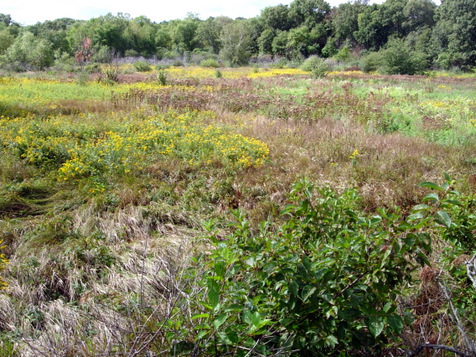 Arlington’s Great Meadows put on a vibrant mix of colors and bloom for all to enjoy. This scene is from the boardwalk. The Friends of Arlington’s Great Meadows have shown exemplary environmental stewardship of this local treasure, under the leadership of David White. Installation of the boardwalk in 2005 provided both increased access and protection. This photo doesn’t do justice to the intricate and structurally impressive web this spider has built. 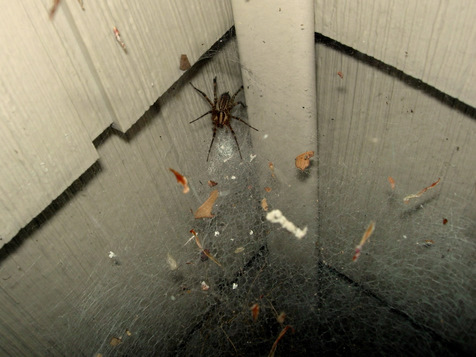 I can’t bear to harm a spider, such artistic and industrious creatures. The web has been in place for over three weeks and counting, through rain and wind. Can anyone tell us more about the species and their life cycle? See collaborator request on our ABOUT page under “OPPORTUNITIES”. While Hurricane Earl was an impressively large storm making its way northward along the Atlantic coast of the US, by the time of it’s early evening arrival in the New England area it had lost it’s vigor and destructive power. 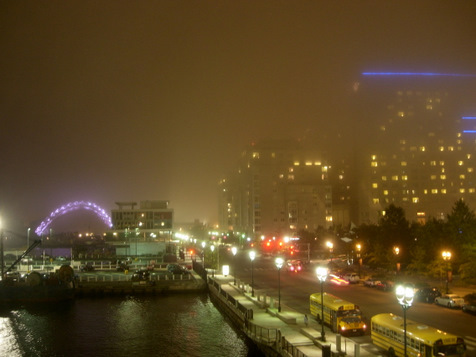 Photo was taken from the outdoor atrium area of the Boston Seaport World Trade Center, looking along the harbor. Sedum is fun to watch, slowing making progress toward late summer or fall bloom. SEPTEMBER is the month for it’s most showy display. It also seems to be popular with bees. Relatively drought tolerant, they are perfect plants to locate near an outdoor sitting area. With so many diverse varieties, it could become a plant hobby in itself! The full moon is always special, but in summer, it’s so much easier to linger outside in the cooling evening and enjoy its radiance. 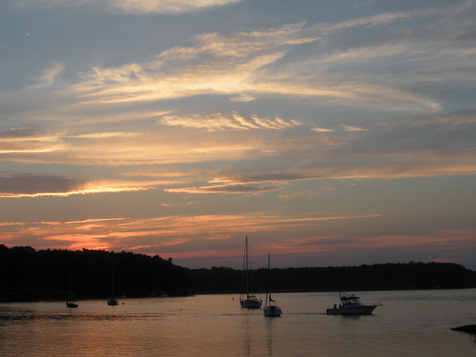 Mid summer often brings lush and vivid sunsets. Newbury Perennial Gardens is an “off the beaten path” find. Besides being a nursery and garden center, they also have a delightful display garden. In June, so many plants are in full bloom, or about to POP like this one. 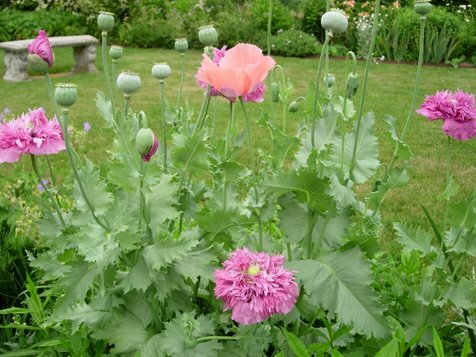 Poppies in the emergent, full bloom, and seed capsule stages at Newbury Perennial Gardens. JUNE is the month for BLOOM! Poppies come in many, many colors, not just girly pink! The Newbury Perennial Gardens is such a beautiful and peaceful place, the Arlington Natural Connections really must cover soon in our blog. 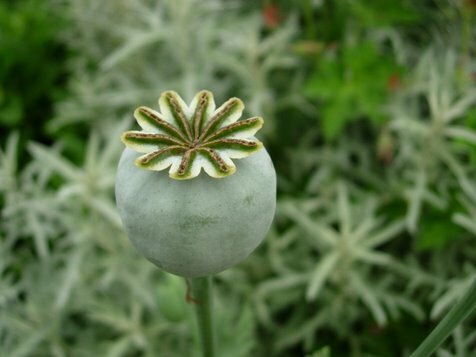 As beautiful as the poppy flowers are, the seed capsules reveal a simplicity, engaging geometric form and serenity all their own. Count the seams on the capsule – there are ten. Hmmm, the number ten rings a bell …… fingers and toes ….. Tempted to take some of these to include in an Arlington Natural Connections “Collection”, but no, not from here. A display of flowers adds a sense of vitality and beauty to an urban setting, greeting apartment dwellers as they return home. Even these small spaces can provide important habitat for insects and birds, a goal now being promoted locally by Grow Native Cambridge. Articulated eloquently by Dan Tallamy in “Bringing Nature Home“. Enjoy these outdoor scenes from nearby Arlington, then get outside yourself and experience Nature firsthand! Contributions to this photo series welcome(email us). 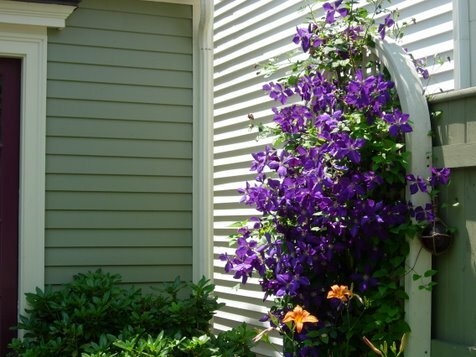 In June, clematis are a reliable climbing vine of intense color. Along with the ubiquitous day lilies they insure insure that June is a celebration of bloom and color. Not too far from Arlington, there is a nursery in Ipswich, that specializes in clematis: COMPLETELY CLEMATIS. Call or visit for advice on your favorite colors and extending bloom throughout the summer. Elderberry also shows it’s lacy bloom at this time of year in our area. 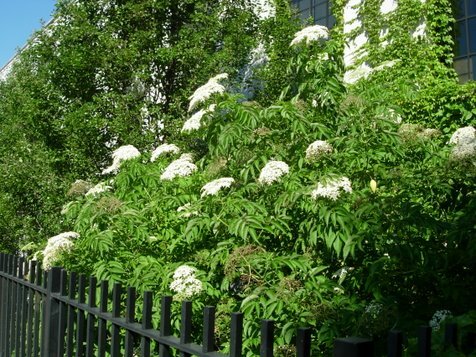 The plant shown here grows along the main Cambridge Post Office near Central Square. 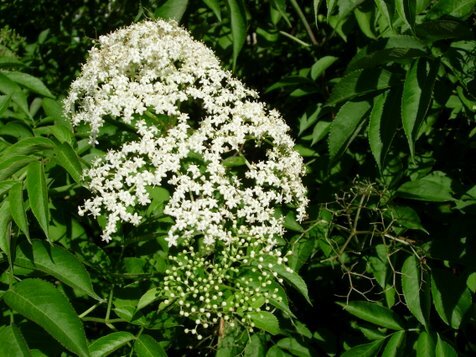 The Elderberry has many tine flower clusters in lacy groupings. 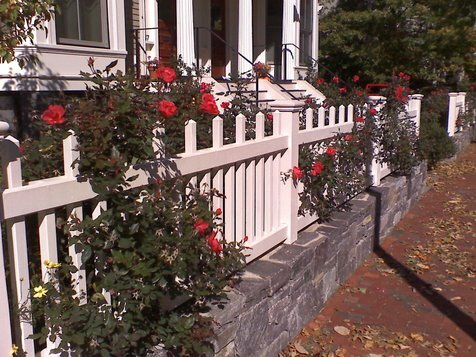 Photo: Front Yard Roses, Hamilton Street, Cambridge MA. “Microbursts” mini, tornado-like winds did some surprise damage along the Minuteman path overnight. While afternoon thunderstorms are beginning to feature at a this time of year, these more damaging events are, thankfully, fairly rare. 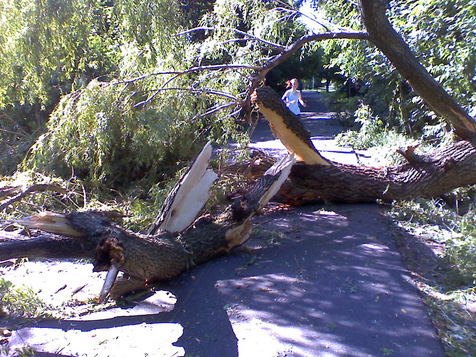 Photo: Overnight Microburst Damage on the Minuteman Bikeway. Enjoy these recent photos of outdoor scenes from nearby Arlington, then get outside and experience Nature firsthand! Contributions to this photo series welcome (email us). 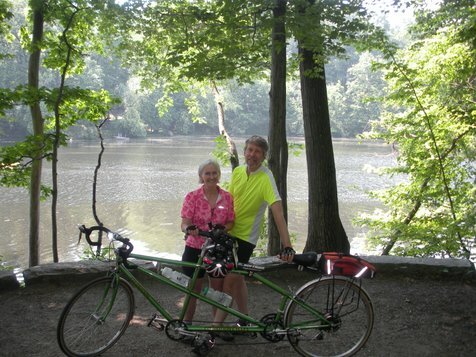 The Nashua River Rail Trail is a great place to bike, with views of the river in many sections. This photo was taken just south of Pepperhill. Biking through an area is a thrill for all the senses, and connects to the environment in a special way. Arlington Natural Connections is interested in bicycling for many reasons, and will promote it as a joyful and practical activity for all. 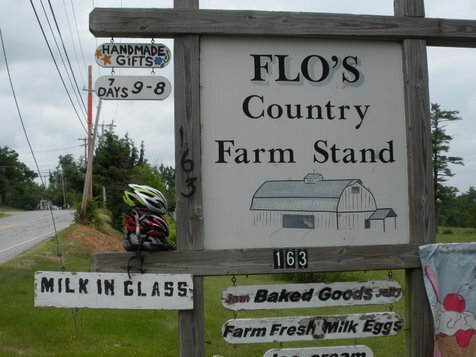 Flo’s Country Farm Stand in Rutland (Central MA) is an example of the rising number of local and regional farms. Americans are waking up to the folly of transporting food great distances. Estimates of more than 1200 miles for a typical American meal are not uncommon. Locally, I am happy whenever I see the large fields being farmed at Wilson Farm in Lexington, and even happier when I pay a visit and sample their delicious produce. 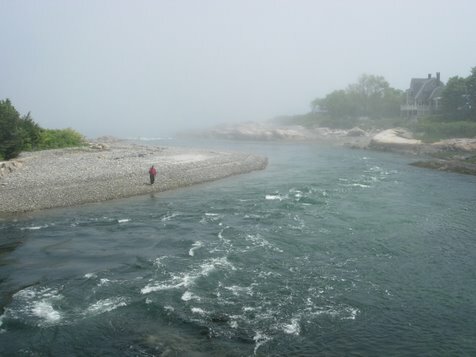 While May has seen a lot of sunny weather, on this morning a light fog hugged the coastal areas near this inlet in Cohasset, at the upper “corner” of the South Shore, where the Boston Harbor ends and the Massachusetts Bay begins. Fishing is a great way to spend time outdoors. This morning the fisherman in red caught a nice big Striped Bass just after this photo was snapped. Above the legal size limit, he called it “dinner”. 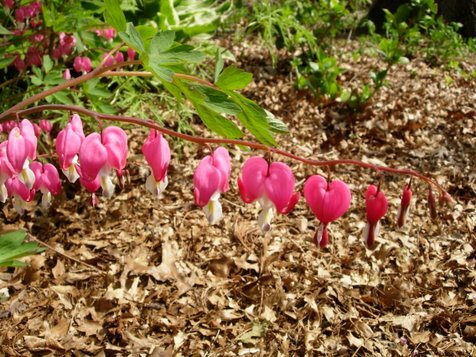 Dicentra, commonly called “Bleeding Heart” for obvious reasons, add a bright shot of color to the spring garden. Last November we discussed the arrival of the Winter Moths . Well today the moth eggs have hatched and the caterpillars are dropping from the trees, mighty hungry. 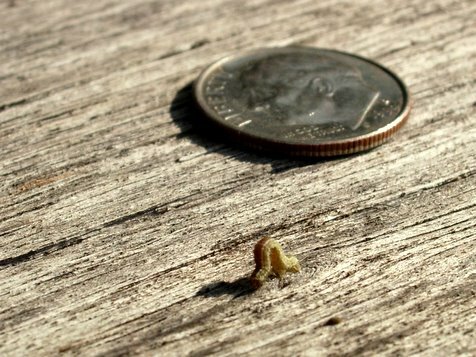 Looks tiny, but they arrive in such numbers, and grow bigger and bigger as they chew off the leaves, and depositing their droppings below. A veritable spray of yellow flower next to this porch in Cambridgeport. 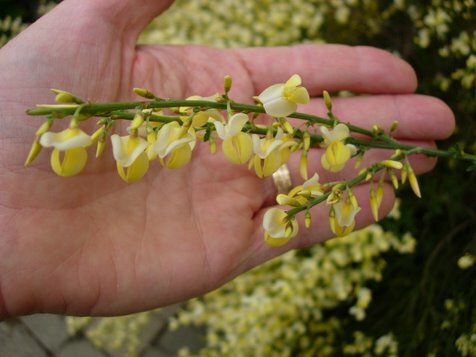 I couldn’t identify this plant; thought it might be a type of broom. One online resource for plant identification and images: the PLANTS Database from the USDA. This database contains primarily native plants. 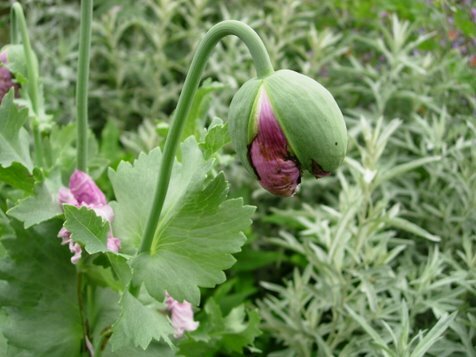 Horticultural and cultivated plants are generally not included. A closer look at the yellow flower. 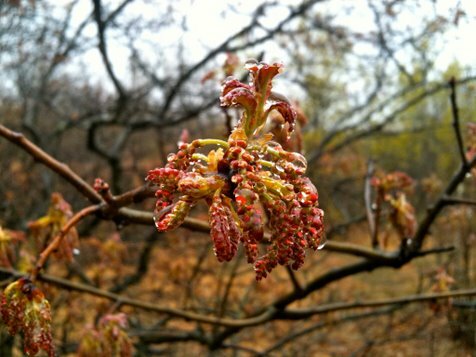 These oak buds were photographed at Arlington’s Great Meadows during a “Third Saturday Nature Walk” led by Don Miller. The Great Meadows harbor a diversity of flora, and Don Miller shares his vast knowledge of native plants in a generous and entertaining way every third Saturday from Spring to Fall. See the Friends of Arlington’s Great Meadows website for information on these hikes, news and access. 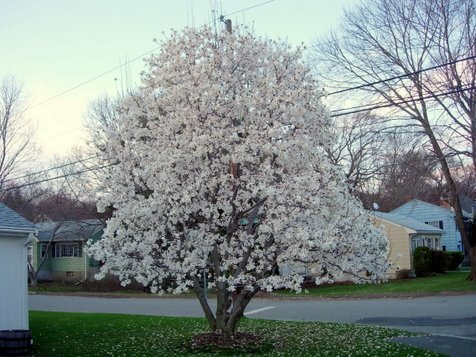 Star Magnolia trees burst out in a prolific display of delicate white flowers. Sometimes short-lived due to strong winds, this year we have enjoyed them for a good long while. Smaller specimens can be seen near the aptly named “Magnolia Field” opposite Thorndike Field near the Alewife end of the Minuteman Bikeway. 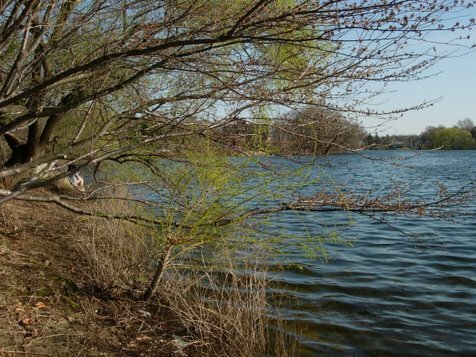 In early spring especially, when tree leaves are sparse, views of Spy Pond makes the section of the Minuteman Bikeway just east of Arlington Center one of the most beautiful along the 11 mile trail. A redevelopment project in recent years is something that all Arlingtonians can be proud of, making the shoreline more accessible and attractive. 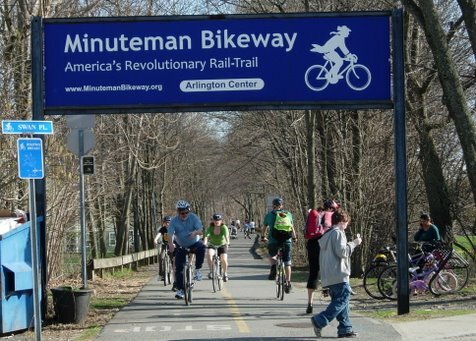 The Minuteman Bikeway is a treasured local resource, used year-around by Arlingtonians and visitors alike. The warm temperatures on this fine April day turned the path into a celebration. Try walking the Minuteman in small sections, on different days, from Alewife to Lexington. Take in the varying character. Keep right! 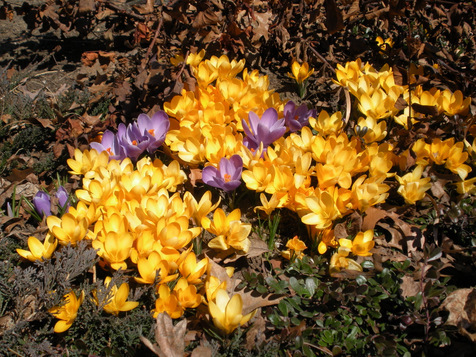 Crocus are always early, the exact date depending on the prevailing weather and the “microclimate” where they are planted. I didn’t catch the earliest ones this year, but by late March the displays were spectacular! Photo: Crocus, 5 Old Colony Road, Arlington MA. Photo: Turkey Hill Sunset, Arlington MA. 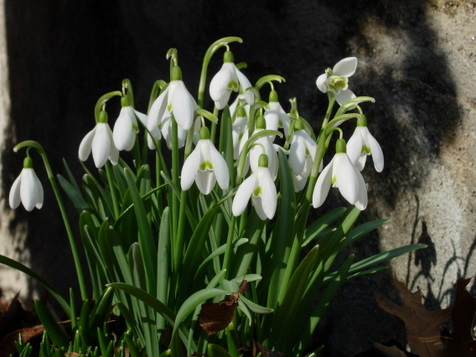 These tiny flowering bulbs called Snowdrops are often the first signs of spring. Located in a warm patch near a porch, they push up in February. They are so early (way before crocuses) that it’s easy to miss the green shoots, being pleasantly surprised by the full flowers. Tiny, only about 6″ tall, they are always a welcome sight, and a hopeful sentinel of spring. Photo: Snowdrops, 5 Old Colony Road, Arlington MA. 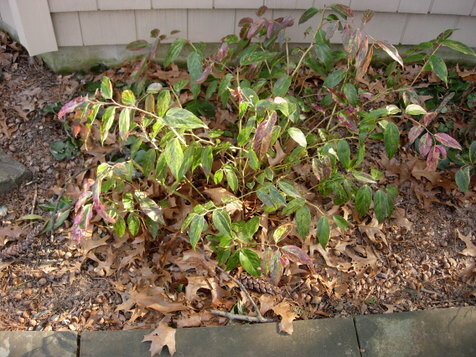 A leafy shrub that stays green in winter: The variegated leaf of “Leucothoe “Girard’s Rainbow”” is a welcome sign of life. Available locally from Weston Nurseries. Alternate native varieties also available. Photo: Leucothoe “Girard’s Rainbow”, 5 Old Colony Road, Arlington MA. With many weeks to wait before we see forsythia flowers, the unmistakable and impossible to miss sign that spring has arrived, the native “Witch Hazel” is already beginning to unfurl it’s blossoms. 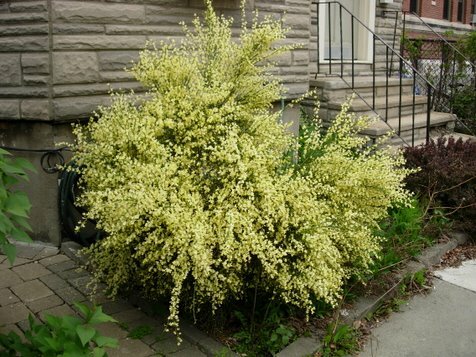 The color is especially welcome at a this time of year, and on warmer days, a pleasant fragrance. 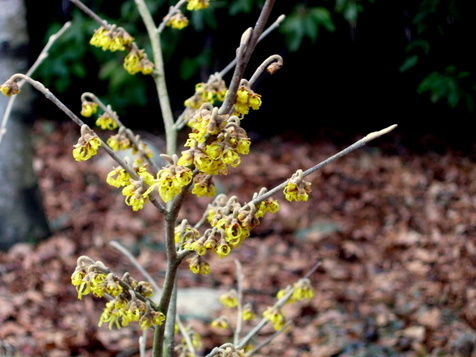 Photo: Witch Hazel, Just Beginning to Bloom. Most of our snow this year seems to have fallen in the mid-Atlantic states to the south. On this morning, a light but even snow turned the landscape into an enchanting white. Can you pick out the tiny steeple of the church in Winchester to the North East? Wet sticky snow provided the perfect material for building snowmen. 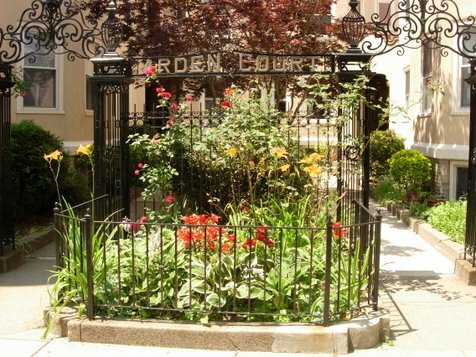 The Cambridgeport section of Cambridge has many “pocket parks”. These small parks break up the monotony of an urban environment. Thomas Hoving was an early advocate and proponent for pocket parks in New York City. Later he was director of the MET art museum. He left us in December 2009. 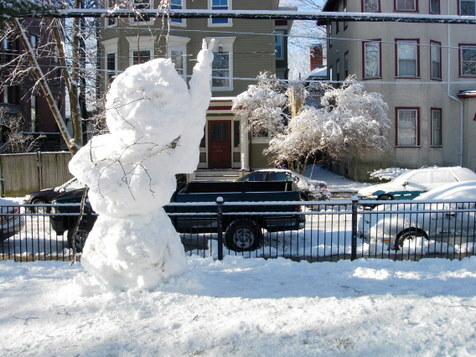 Photo: Funky Snowman, Dana Park, Cambridgeport. Enjoy these outdoor scenes from nearby Arlington, then get outside and experience Nature firsthand! Contributions to this photo series welcome (email us). 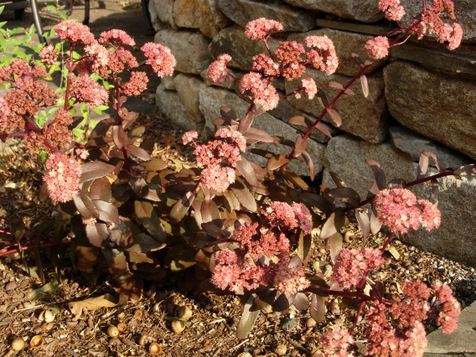 Sedums are prolific in variety, providing great visual interest in home gardens. Some varieties are ideal for “Green Roofs” like those designed by Apex Green Roofs a Somerville company. 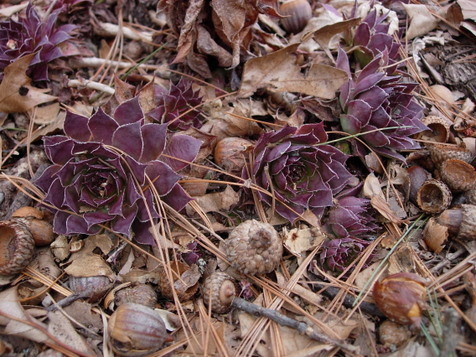 Some varieties also act like seasonal clocks, emerging early and saving their showy displays for Fall. Arlington Natural Connections is interested in local green roofs, and will present more features on this topic in future. Closer detail, showing the creases and texture that develop in older beech trees where branches meet. When you get the chance, touch things you find in nature – often the actual texture is a little different than expected. Of course, be a little careful for plants like, well, the ubiquitous poison ivy, sumac, oak. (Come along on a “3rd Saturday” hike in Arlington’s Great Meadows, where you can learn to unmistakably identify these plants). Crossing over the bridge behind “The Old Manse”, the Minuteman National Park Service Site North Bridge Visitor Center has some beautiful beech trees growing in front. 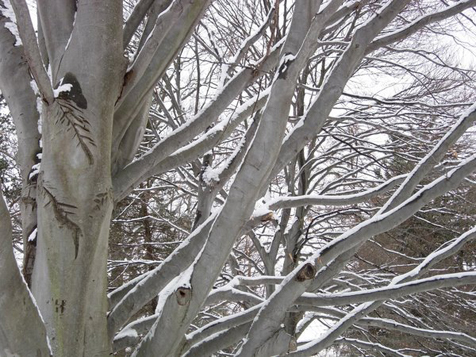 When trees are without their leaves in winter, it is easier to appreciate their form, branching structure and bark texture. 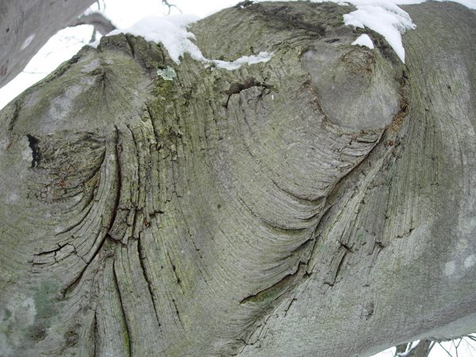 Beech trees have a wonderfully smooth bark. A dusting of snow further enhances the visual impact. Connection to nature. A basic human need, often overlooked. 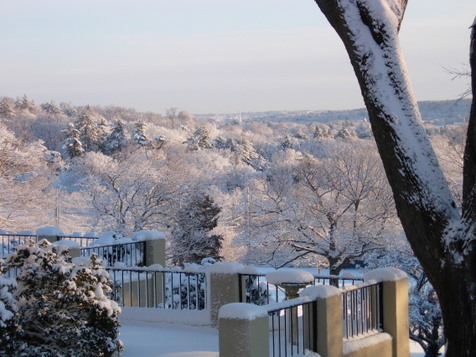 Explore this site for ways to connect, in Arlington Massachusetts, our home town. But not too long. Get outside, meet up, or savor some solitude. Diversify and explore your connections to nature in an active, personal way. At least a few minutes today, and every day. We are happy to announce the public launch of this website, in connection with Arlington's Town Day on September 25, 2010. The site will continue to evolve, as a venue for our projects and as a resource for connecting to nature in Arlington. Thanks to Andrai Whitted for website design services and advice. This work was made possible by a grant from the Arlington Cultural Council, a local agency supported by the Massachusetts Cultural Council, a state agency. The "Scenes of the Season" feature in the photo slider above is a current project. The photos are intended as a natural calendar, of the ever-changing natural world that surrounds us. Stop in often to experience these glimpses of the outdoors, when you might not be able to go out yourself. *By subscribing you will receive an email when new content is added to the Arlington Natural Connections Weblog (not more than 2-4 times/month). You will be asked to confirm your subscription request and can unsubscribe at any time. Try it, we hope you will find it fun and useful! © 2010 Arlington Natural Connections Project - Powered by Wordpress.